Your house can be a powerful financial asset. As you continue to make payments on your mortgage, you build equity in your home, which opens the door to other financial opportunities. Your home’s equity is the difference between your home’s market value and the balance of any mortgages against your home. It’s the part of the home’s value that belongs to you, not the lender. Equity should increase over time as you pay the mortgage balance down, says Chris Hurley, mortgage/consumer lending consultant at Dupaco Community Credit Union’s Cedar Heights branch in Cedar Falls, Iowa. You can calculate the equity in your home with Dupaco’s home equity calculator. 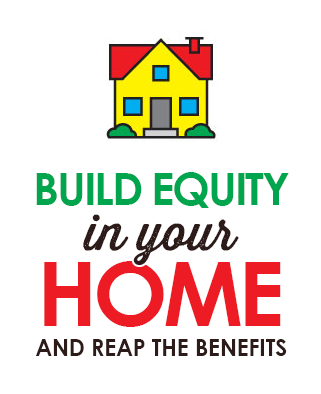 You can borrow against the equity in your home with a Home Equity Line of Credit, or HELOC. A revolving line of credit is established, and it can be drawn upon and paid down by the homeowner for a set period. Dupaco members can transfer funds from their HELOC to a checking or savings account through Shine Online Banking, over the phone, in-person at a branch or by using checks tied directly to the loan. Boost your payments: You also can round up your monthly mortgage payments to pay off your loan—and build equity—faster. A free Dupaco Money Makeover can help you review your entire budget to find ways to increase your mortgage payments. “The additional funds would be applied toward the principal balance,” Hurley says.